This is a very attractive weeping tree, Acer palmatum ‘Dissectum Viridis’ has deeply divided foliage, a good mid green and a with serrated leaf margins it has a delicate lacy look. Grown as a grafted standard, the height will be determined by the graft, usually around 1.5 to 2 metres, occasionally less. New growth is a bronze green, turing to a bright mid green by early summer. Autumn tones are a brilliant red with orange. 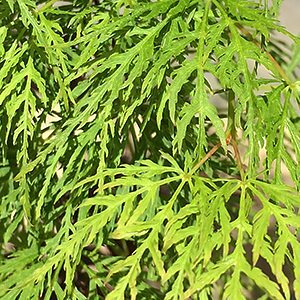 Grow Acer palmatum ‘Dissectum Viridis’ in a courtyard where it will provide shade in summer, it will grow well in containers, and is also suited to part shaded positions in the garden. Best grown in a humus rich moist soil, Acer palmatum ‘Dissectum Viridis’ will grow well in part shade to full sun. In warmer areas, some afternoon shade in summer will be beneficial to appearance. pruning is generally not required except for removal of any damaged growth or suckers below the graft. Height – To around 2 metres depending on the graft. Foliage – Very fine lacy foliage.